Founded by veteran yogi Steven Earth Metz, Earth’s Power Yoga brings an offering of hot – but not Bikram scorching – yoga classes to West Hollywood. Earth’s Power caters to yogis and yogi-curious alike, giving athletes at all levels a powerful workout and focused meditation. Students will leave the class sweating and centered, and hopefully excited to return for the next powerful session. Why You Should Check It Out: Whether you’re new to the hot yoga world, or an uber-flexible yogi impervious to the heat, there’s a spot for your mat and an instructor ready to support you at Earth’s Power. Start slow with modified poses, and build when you’re ready: the mixed-level classes are designed for all ability levels. The diverse offering of power yoga classes provides something for every taste, not to mention reasons to keep going back! The studio even offers late night classes on weeknights at 8:30 PM (so ditch the “working late” excuse and get to class). All classes combine strength training with yoga meditation, meaning you’ll leave the room physically stronger, and mentally balanced. Only have limited time to Zen out? Most of Earth’s Power’s classes are only an hour; the longest (non-private) sessions extend to 75 minutes. Know Before You Go: Park your car in one of the free tandem spots in the lot behind the studio. 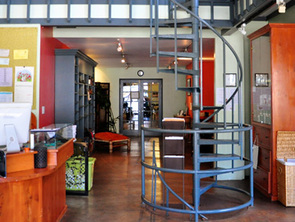 Check in at the front desk, located on the second level of the building, before heading to level three for class. The classes are often packed, but the studio has (rather wisely) marked “parking spots” for mats with black lines on the floor. These delineations ease the settling in process immensely. Studio Amenities: showers, changing rooms, lockers (students provide own locks) and towel rental. Multi-Media Mix: New to the Earth’s Power lineup is Yogascape. 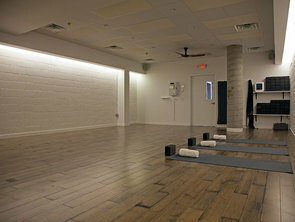 The hour-long class, which is similar in structure to the Earth’s Power class, accompanies a vinyasa Flow with 360-degree surround video system. The ambient projections serve not just to enhance the mood of the space, but also as part of meditations during class. Advice for First Timers: Hot Yoga newbies should prepare to sweat...a lot. Wear comfortable but snug clothing that you can stretch and sweat in, preferably of the sweat-wicking variety. Bring water (or purchase onsite) and have a towel ready to prevent the slippery effect sweat has on yoga mats. Don’t be afraid to take a rest pose to focus on breathing if the heat becomes too much, and pay close attention to the modifications instructors offer for beginners. No need to be a hero in your first class! Enter the class with a mind that is open not just to the physical benefits, but also the spiritual benefits of group yoga. Any cynicism can wait for you outside the studio doors. Check out their schedule here to experience the mental and physical benefits of Earth's Power Yoga today.